Just over 3 months ago a keen group of local paddlers and walkers rallied together to collect rubbish along the eastern and upper reaches of the Swan River and river banks from Bayswater to Caversham. It was such a great day, we‘ve decided to run the event on a quarterly basis. We’ll be having a BYO BBQ afterwards at Garvey Park and Halina from Western Australian Seabird Rescue will be joining us to talk about the great work they do and explain how we can assist if we come across any birdlife in trouble so please try to come along! The other great news is the new app from Tangaroa Blue that will allow us to log rubbish collected and send the information to the Australian Marine Debris Initiative data base which is vitally important so they can analyse the scale of pollution affecting the rivers and oceans. River Guardians have donated gloves, bags and tongs which can be collected from the SUP Tonic trailer at any sup session prior to the event or at Garvey Park on the day. Hopefully we will have Nauti Picnics with us again cruising up and down the river to help anyone in need of assistance which was an invaluable contribution during our last clean up day. Several launch locations have been set out as outlined below and covers the Eastern corridor. You can do as short or as long as you like however we have limited the time to finish within 2 hours. The locations below are just suggestions so if you’d like to start somewhere else please do. Don’t forget, walkers are welcome and very much needed where paddlers can’t access. 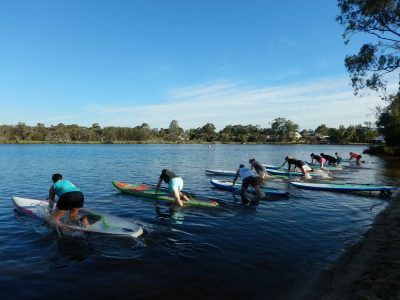 9.00 am: Start from your chosen launch location or from Garvey Park if you need to hire a board. At 9.00 am on the dot check in to the events page and post “keep our river clean” so people can track our progress via facebook and see who is taking part. Log collection of rubbish via Tangaroa Blue app as you go if possible or at the end of the event, at Garvey Park. Dispose of your rubbish in the council bins provided at your launch location or bring to Garvey Park. Meet us at Garvey Park afterwards at 12.00 pm for a talk about the Western Australian Seabird Rescue organisation. The launch locations are suggestions only so feel free to start somewhere else if you prefer. This stretch covers 20 kms from Belmont to Middle Swan. There is no pressure on anyone to cover a long distance, 4km round trip is a comfortable distance from any launch spot or time it within 1 – 2 hours. Take note of the comments about some of the locations just in case this affects you.